50 ml bottle. Nose cap for easy application. Shelf life in room temperature unopened 2 years and opened 12 months. NOTE: Contains no perfumes, colors, parabens, silicon, mineral oils or animal-based ingredients. 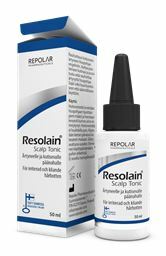 Dispense a small amount of the tonic to the scalp with the help of the tapered nozzle and then massaged in until it’s absorbed. Do not rinse. Apply solution once or twice daily after washing the hair or between the washes.